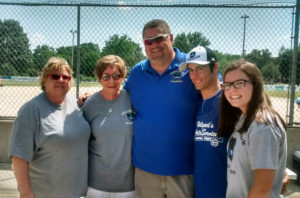 Brad Lindmark, his wife, mother, son and daughter attended the Coaches’ Clincher Cup tournament at Leland Park, Sunday, June 11. Stateline Baseball took on the Rockford Police Department for the championship. 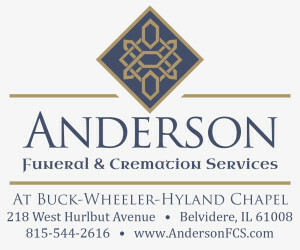 The fundraising event was held to benefit the GregLindmark Foundation. From left -Cheryl, (Lindmark’s sister-in-law; Lisa, (Lindmark’s mother); brother Brad; and Lindmark’s nephew and niece Zach and Anna. Greg Lindmark retired as a Rockford Police Officer after 29 years on the force.He went on to become chief investigator for the Winnebago County States Attorney’s Office.His next plan was to move to Door County with his wife following his second retirement. Learning that suicide is one of the leading causes of death among police officers, Greg’s brother Brad and Brad’s wife Cheryl decided to do something to bring awareness of the emotional and mental burden so many officers struggle with, and erase the stigma of asking for help. The couple established the Greg Lindmark Foundation.The goal of the foundation is to raise funds to lessen the impact of stress and trauma to police officers through education and support programs. Each year since Greg’s death, the Lindmark family hosts an annual golf tournament at Aldeen Golf Club in Rockford, a baseball fundraising event at Rivets Stadium in Rockford and the Coach’s Clincher Softball Tournament at Leland Park in Roscoe.